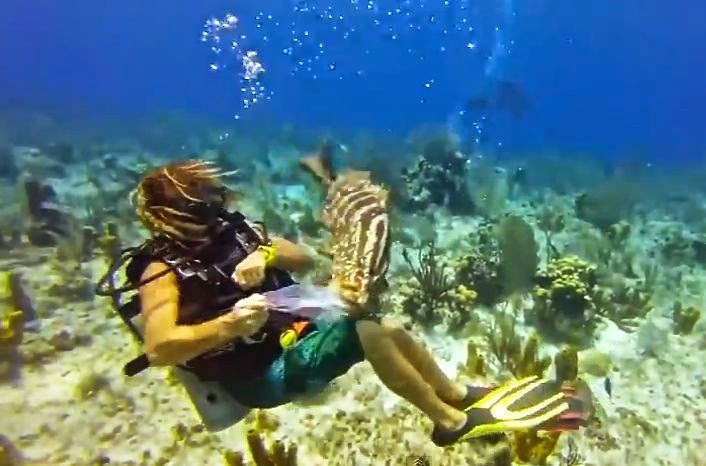 A diver in the Cayman Islands was swimming along the ocean floor holding a plastic baggie with a small lionfish he’d captured when out of nowhere he was confronted by an aggressive grouper that really wanted the lionfish. A wrestling match ensued and, well, guess who won? The grouper really, really wanted that lionfish and wasn’t taking no for an answer. The grouper pulled the baggie from the diver’s hand three times. At one point, the diver attempted to push the grouper away, but the fish wouldn’t be denied. Little did the grouper know that the diver had actually caught the lionfish to feed to the grouper. Once the diver had the chance, he released the lionfish and the impatient grouper gulped it down. Paul Kim, who shot the video, told GrindTV that the invasive and destructive lionfish kill and maim reef fish and ruin the food chain, so divers take every opportunity to kill them, as is perfectly legal. “The best way to dispose of them is to feed them to the native Nassau groupers who don’t see the lionfish as food, but are quickly learning to identify them as so,” Kim said. “We were just on a typical dive when a dive master happened to trap a lionfish and coax it into a plastic bag. The dive master swam around looking for a grouper to feed it to when one came out of the blue and snatched the bag from his hand.